Risotto is one of those classic Italian dishes that one would be crazy to try and make. Let me emphasize crazy. Especially when it is 32° C (about 90° F) and sunny outside, and you will be slaving away in front of a hot stove continuously for about 30 minutes. Yes, insane… and not to mention, extremely, extremely hot. As insane as it seems in theory, it really is worth it, because the result is utterly scrumptious. Well judging by the multiple servings my family had… it is very good. 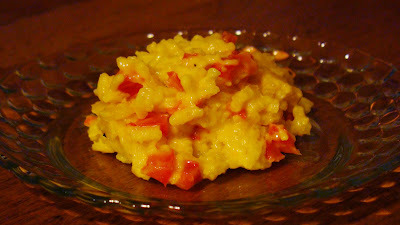 I found this recipe for red pepper risotto here. When I stumbled upon it the other day, I just knew I had to make it! This would be my second attempt at making risotto; the first try was a major flop. I put too many onions, and if you know me, then you will know how much I hate cooked onions. For this risotto, I didn’t really make any changes to the recipe other than excluding a little onion. Bring the chicken broth to a simmer. Grate onion, and chop red pepper. In medium-low heat heat up olive oil in a large skillet and cook the onion until translucent. (1-2 minutes). Add the red peppers and cook for about 9 minutes. At the end, stir in a little more liquid and turn off heat. Stir in turmeric and add cheeses and stir. Serve immediately! Not only is this wonderful the first night, but it makes the most amazing left overs!! So it’s time to get over your fear of risotto and dig into this wonderful risotto! !